The Cuisinart GR-4 is an Electric Grill and griddler® is an ideal appliance for making perfect panini, pancakes, sausages, grilled cheese, steaks to name a few. It can be used as a Contact grill, panini press, full grill, full griddle, and half grill/half griddle. 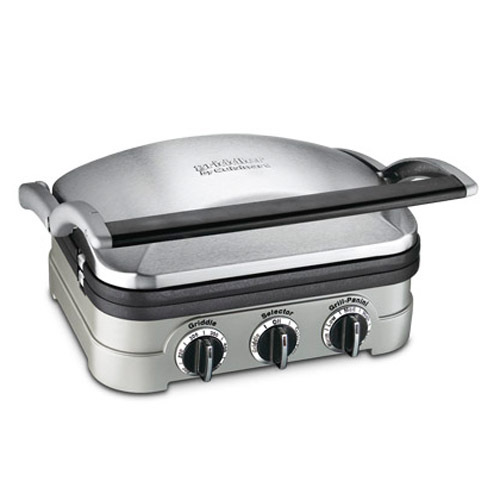 The Cuisinart Griddler Contact Grill Nic has many exciting features for users of all types. You can extend the lifetime of your Cuisinart Griddler Contact Grill Nic with the purchase of a FactoryOutletStore Factory Protection Plan. See the Cuisinart Griddler Contact Grill Nic gallery images above for more product views. The Cuisinart Griddler Contact Grill Nic is sold as a Brand New Unopened Item. Just used this griddle it is great did some steaks came out perfect and clean up is a breeze. Can't wait to do breakfast! !